Like everyone else I’m sure, the rain has limited our metal detecting time. Rain is good, but too much rain is not good. Soggy soil, high grass just makes MD a bear. Still I managed another first for this year! I went out of town to a place where I found a seated dime last year. I’ve thought about going back constantly since my last trip. Its an hour away and not a place I can go frequently. When I pulled up to the place, the grass was freshly mowed putting a large smile on my face. The fairly large field is behind a school built in the 1940’s, but something else has gone on there since we’ve found much older coins than the 40’s. I crawled around for 45 minutes not finding a single coin. Since I know I passed on shallow coins before (it was super cold and I stuck to digging the deeper coins) I knew someone else had been there. Finally I hit a target in the silver dime range, mixed in with constant iron numbers. I dug a 1916 mercury dime with three nails with it in the hole. Wow, a testament to the Etrac again! 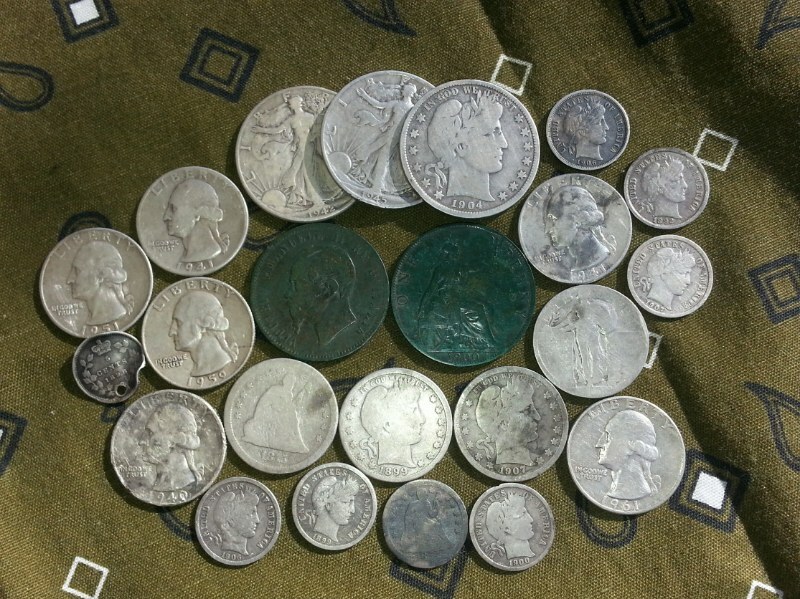 Hunted another 30 – 40 minutes and I dug another Mercury dime, a 1920D also in a hole with nails. I hunted another hour or more and hit a target with silver quarter numbers and found a silver ring. I was really hoping for a silver quarter! Then I came across a target with numbers not like anything I was hitting earlier, 1-39, 1-36, 1-31 pretty constantly. With the 1-39, I thought it was going to be a deep old wheat. Then I saw a thin sliver of silver, really, a tang of a pull tab!? Nope, it was a super thin, very worn 1854 seated dime! Definitely the thinnest dime I’ve found to date. I hunted another hour before I had to leave. I hope I can get back there soon, I’m sure there must be more.